We have gained expertise in domain, offering high grade Fire Pump House Automation services to our prestigious clients. The services we offer are known for their hassle free performance. Our skilled professionals, has gained expertise in offering Fire Pump House Automation services. Complete Pump House Management System, that connects pump houses to mobiles and to remote control room, on a PC. All alert messages are broadcasted to group of 5 users on their mobiles, as well as, to the control room. Individual pumps can be controlled remotely through PC or thorugh authorised mobile numbers. Fire water pumping station is basically PLC based control station used mostly where the hazardous industrial applications are carried out. 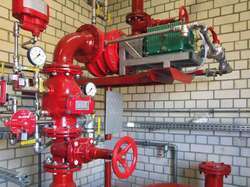 It provides a water source when a fire is detected in the plant to take quick action against fire. Mostly, in the oil refineries Fire Water Pump House Automation is applicable. We are providing the solution to establish the Fire Water Pumping Station. Softbit Technologies Pvt. Ltd., New Delhi presents revolutionary product – GPRS/GSM/SMS enabled Wireless data loggers/RTUs, indigenously developed, first time in India for remote monitoring, control and automation of water pump house. 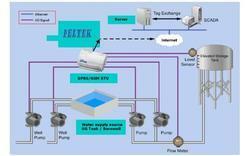 Live monitoring & control of pump house can be done through SCADA (web based facility also available). Ready to use pre-programed data loggers/RTUs.